Last night, just as I was falling asleep, my left foot cramped up. After I got out of bed, the calf and shin cramped too. I applied some Tiger Balm, and it seemed to subside so I got back into bed... about an hour later, both feet cramped up and I got up and ran a very hot bath. It took about 10 minutes for the cramps to let up and I sat in the tub for a good 15 minutes or more, just to make sure they were gone. They were quite severe and it took all my effort to breath deeply, and make myself relax. So, now I am wondering why that happened. I haven't had leg cramps for several months and I thought I was done with them. I stretched for several minutes after yesterday's run. I drank tonic water in the afternoon. I kept my feet and legs warm throughout the evening... so why the cramps? Dehydration? Lack of potassium? Not stretching long enough? I need to be very careful as we are moving onto the sailboat today, and there is no tub there. This morning, after we let breakfast settle for an hour or so, we headed out for a short run - only 2.75 km - our last in this neighborhood for a while. 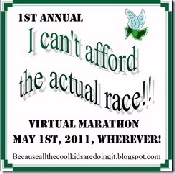 I knew I wouldn't get in enough to complete the Virtual Marathon, but I that is okay. I wanted to attempt it, even though I knew it was more than likely I wouldn't complete it. I will watch for the next one. I have never really set running goals. But May is my birthday month, and this year I am counting down to a BIG birthday next year... so I am going to start setting some goals. There are 31 days in May so I am going to set a goal of running 31 km this month. That will likely work out to 3 or 4 km every 3 or 4 days. It will be an effort to get it in, and that is good. I also want to continue with my 100 Pushups Challenge. It will be so good to get back to the boat today. Fantastic effort, you are in for prizes! Great goal for the month of May--good luck!